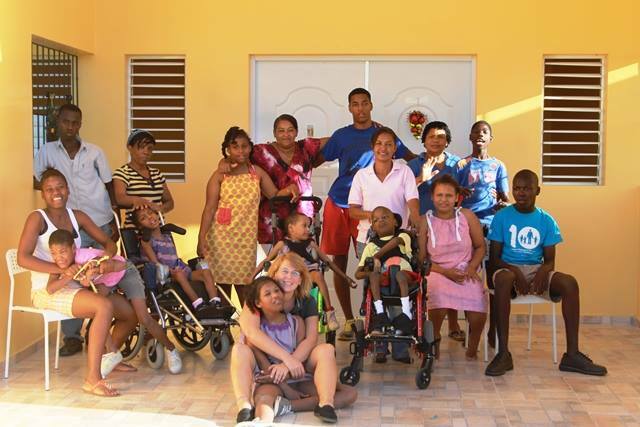 Since December of 2013, nine special needs children and their caregivers have lived in a new house called San Marcos in the NPH home in the Dominican Republic. It has been a very big and positive change for not only the children but the caregivers as well. With the new house and new recourses, care for the children is more individualized and pertinent to each child. The change is apparent in the children and caregivers through better cooperation, motivation and positive personality changes. The house is not just a place for the children to sleep, eat, rest and play in a protected environment, but much more. The vision of San Marcos is to have a quality of life appropriate for children with special needs, where they are able to develop individually and independently while participating as much as possible in a normal life. NPH strives for these children to learn independence in their personal needs, to have a worthwhile job, to participate positively in the community and be part of a life with other children. In San Marcos a daily routine is established, care plans for each child are worked out and each individuals abilities is encouraged. The caregivers work together with various therapists to work out the best individual therapies for each child. Already there is a visible difference in the children and caregivers. The caregivers have more space, equipment, training and time to give individual care to the children. The children are receiving better therapies and more attention. This is evident through many of the children improving with their mobility, personal habits, attitudes and behavior.